An "artist-in-residence" and a new plant shop are among the features unveiled as part of a £4m revamp of Coventry's main park. 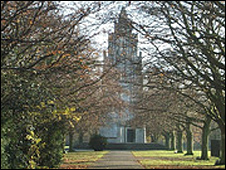 The War Memorial Park was given £2.8m by the Heritage Lottery Fund and the Big Lottery Fund in April. The extra cash is coming from the city council. The plans are being drawn up now and work is expected to start on the park in February. The park opened in 1921 as a tribute to those who died in World War I. Under the plans, a vandalised shelter would be converted into a plant sales shop and an artist would be based in the park to capture the different seasons, council chiefs said. The project is expected to be finished by March 2011.